Ediacaran roots extend deeper into geologic time? Several years ago while working in south Kazakhstan, my colleagues and I were stuck at a place called Maly Karatau just north of the Kyrgyzstan border. The geology of the region is interesting and was once of economic importance during the days of the Soviet Union. It is rich in early Cambrian age phosphorites which were mined for phosphorus. The geologic section is fairly complete and covers much of the Neoproterozoic (~850–542 million years ago). Our initial target focused on a sequence of volcaniclastic red and green sediments as part of a larger effort to track the initial stages of Central Asian assembly. The younger part of the section was fairly well-constrained in age from Cambrian to Ordovician, but the lower part of the section was not known. 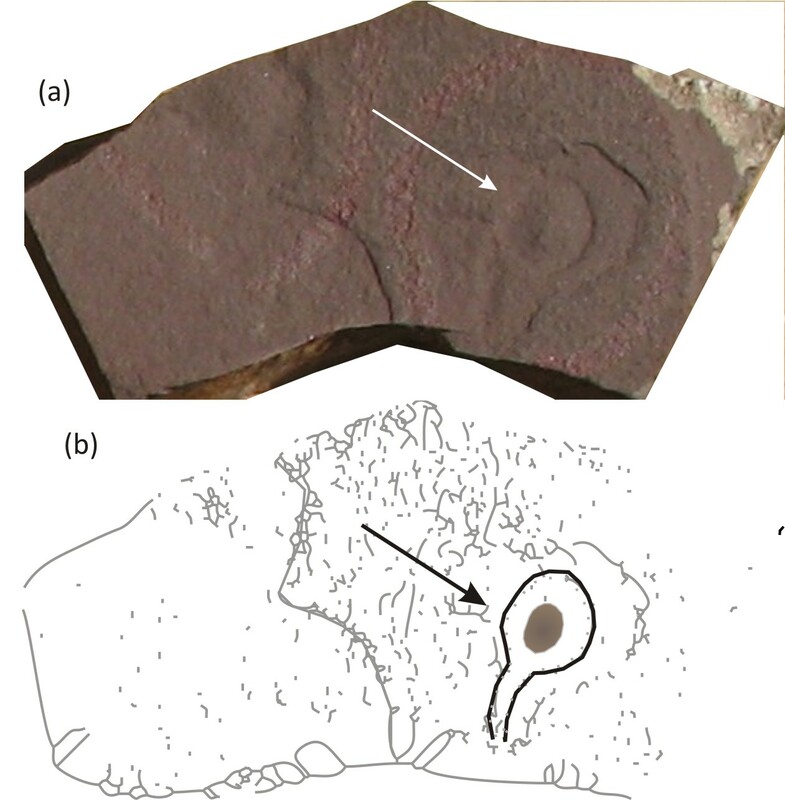 Since the section included the Ediacaran Period (635–542 Ma), we also hoped to find some evidence for Ediacaran fossils. We succeeded in a way we hadn’t imagined. While stuck in the region (our driver had a mild stroke in the field), we discovered two things about the sequence. The first was a glacial tillite in the middle part of the section that had not been adequately described. The second was discoidal impressions in a sedimentary unit along with ‘elephant-wrinkle’ structures on the upper surface of the bedding. These elephant wrinkle structures are interpreted as microbial mats and are often found in conjunction with Ediacara fauna. 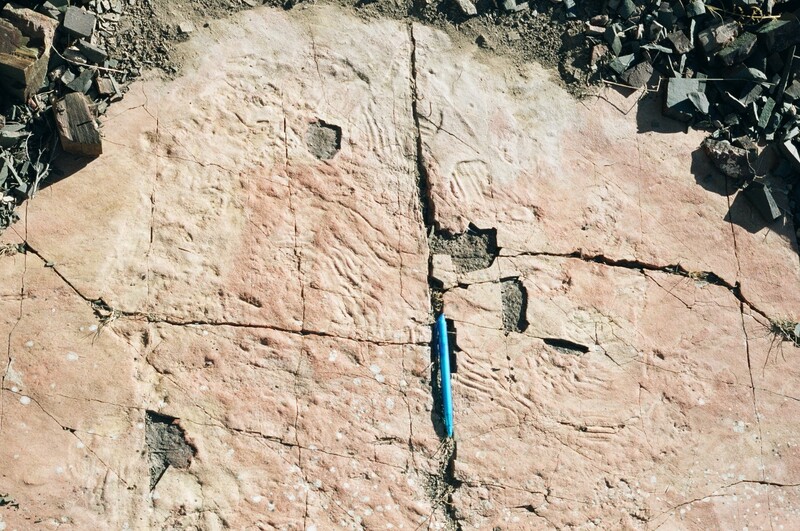 There were two distinct discoidal impressions. One was a simple disc with mostly nondescript central depression (one occurrence with a small central nodule) which is similar in appearance to the Ediacara discoidal fossil Nimbia occlusa. The second contained a central invagination typical of the junior morphs of Aspidella terranovica. (top) Small discoidal fossils Nimbia occlusa and Aspidella terranovica in the Kurgan Formation (bottom left) Nimbia occlusa in negative relief (bottom right) photo inversion of the fossil showing what the impression would look like in positive relief. 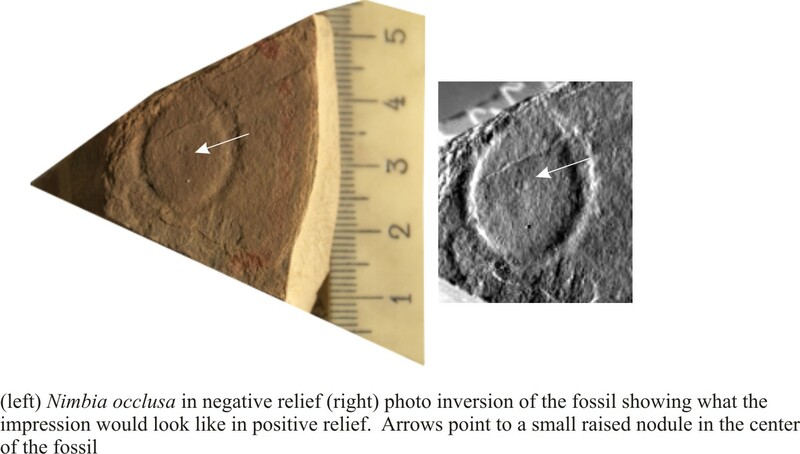 Arrows point to a small raised nodule in the center of the fossil. Last, we found one fairly complex impression of a discoidal fossil with a ‘stem-like’ protuberance of unknown affinity, but related to a morph of Aspidella. At the time of our discovery, none of this was particularly exciting since it was entirely plausible that the sequence was of Ediacaran age. Our work in the lab is what provided the first surprise. The general consensus is that the Ediacara fauna reached their zenith around 565 Ma following the last of the severe glacial epochs. In fact, many argue that the so-called Snowball Earth episodes provided the stress necessary for the evolution of complex life during the Ediacaran-Cambrian interval. But the age of the rocks came back as 766 Ma. This is more than 100 million years older than the previously reported occurrences of Nimbia and was a bit of a shock. Furthermore, our study of stable isotopes on the glacial deposits indicated that they are most likely of Marinoan age (~650 Ma). Since the fossils were found stratigraphically well below these glacial rocks, our age estimate made even more sense. These macroscopic fossils are not without controversy and many attribute them to bacterial colonies, lichens or fungi. But they have also been described as body fossils of frondose-like multicellular organisms. 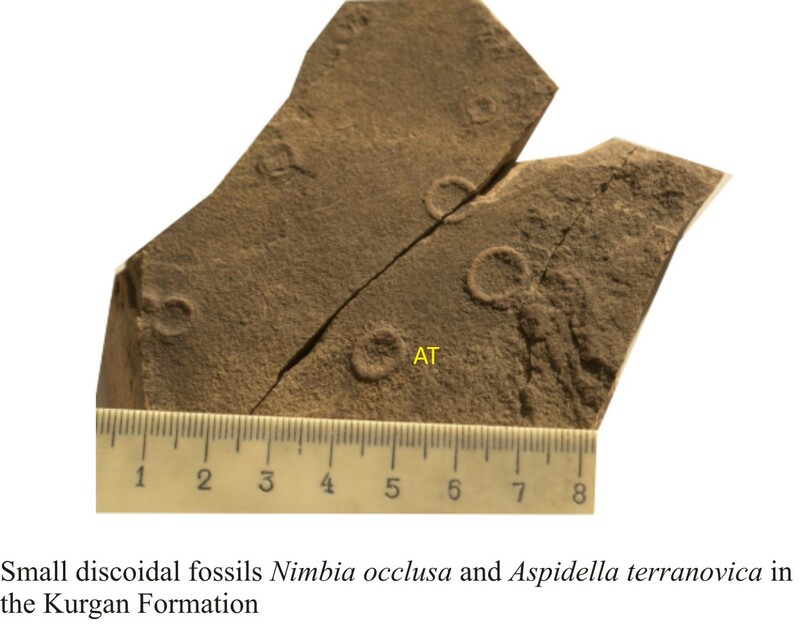 Whatever their exact classification, these fossils are the oldest “Ediacara” discovered to date and precede the previous oldest by about 100 million years. More interesting is that they appear to have passed through all the myriad climatic and tectonic changes of the Neoproterozoic without much change in bauplan. If they are eventually confirmed to be metazoan remains, then the roots of the so-called Cambrian explosion will continue to be pushed further into deep time and its ‘slow fuse’ will grow longer. Meert, J.G., Gibsher, A.S., Levashova, N.M., Grice, W.C. and Kamenov, G.D., Glaciation and ~770 Ma Ediacara (?) 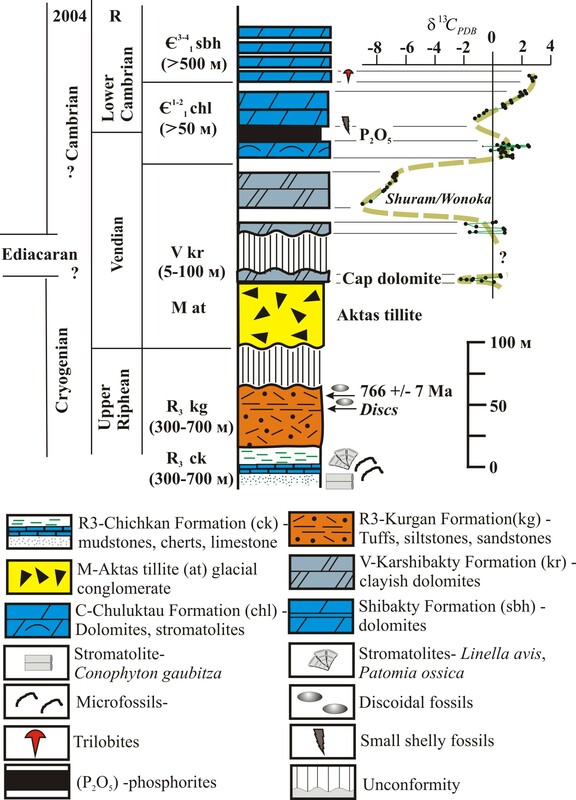 Fossils from the Lesser Karatau Microcontinent, Kazakhstan, Gondwana Research (large pdf). doi10.1016/j.gr2010.11.008.